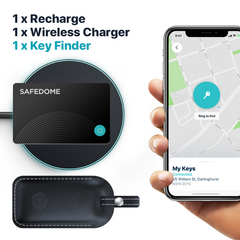 The Safedome Recharge Bluetooth Tracker makes looking after what’s valuable to you, easy. Whether you’ve left your wallet at home, lost your phone down the back of the couch or misplaced your bag on a busy day. It’s your own personal backup before losing something turns into a real problem. The app alerts you if you’ve left your item behind, showing its last location on a map. Made with the highest quality components combined with great design, it’s the world’s first Bluetooth tracker that can be wirelessly charged. Bluetooth tech at it’s best. Finds your things, Fast. How long does the Recharge card last on a single charge? The card will last up to 3 months on a full charge. It takes about 1 hour to fully charge the card. Can I charge my phone or smart devices using the supplied wireless charger? Yes. Our wireless charger also works with Qi compatible smartphones and devices, like the latest iPhones, Google Pixel and Samsung devices. Can I charge the card off other wireless chargers? 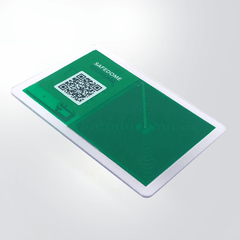 The Safedome Recharge card can be charged using any Qi compatible wireless chargers. If the card is not charging of another manufacturers charger, reposition the card until you see the LED light up. Safedome Recharge uses Bluetooth 5, the latest version of the technology. It greatly increases range and improves connectivity especially when you are indoors. Does the card make a noise? You can 'ring' the Safedome Recharge card using the Safedome app. This feature only works when they app and card are connected and in-range. Pack of 2 Stickers for Safedome Classic Card.